Bleed American is the fourth studio album by American alternative rock band Jimmy Eat World. The album was released on July 18, 2001. The album was the third Jimmy Eat World album produced by former Drive Like Jehu drummer Mark Trombino. The album artwork is taken from William Eggleston’s photograph “Memphis”. 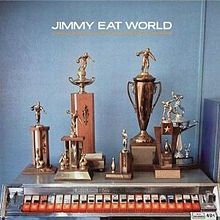 Out of concern that the album’s title may be misinterpreted, the album was re-released as the eponymous (Jimmy Eat World) following the September 11 attacks. In addition, the title track was renamed “Salt Sweat Sugar”. On April 28, 2008, a deluxe edition of the album was released with a bonus disc containing several b-sides, acoustic versions, live versions, demo versions and previously unreleased tracks. The original album and track title Bleed American were restored. The album was a critical and commercial success, helping the band gain mainstream popularity. Bleed American was well received by music critics and was later certified platinum by the Recording Industry Association of America (RIAA), platinum by the Canadian Recording Industry Association (CRIA), and silver by the British Phonographic Industry (BPI).